Malaysia Most Wanted Event scout for you the best places for New Year Countdown with party, music and fireworks! Check out the full list of New Year Eve Events for 2009. Teo Chew Cendol @ Penang Road, this is the most famous cendol road side stall in Penang, and you get delicious Cendol for just RM 1.60, definitely a very good deal. Joo Hooi Cafe @ Penang Road, is just beside Teo Chew Cendol which serve good Laksa. The Friend Keow Teow looks good, but I didn't try it. You are not allowed to bring in the Teo Chew Cendol from outside, else they will charge you RM 0.50. Ah Leng FKT @ Jalan Dato Keramat, within Kafe Khoon Hiang serves delicious Fried Keow Teow with 3 big prawns for RM 4.50. Him Hiang Biscuit @ Burma Road, a good places to buy goodies of Biscuit (Tau Sah Piah and Heong Peng) for your friends and families. Nasi Kandar Line Clear @ Penang Road, serves authentic Indian Nasi Kandar in the back Alley, and pretty good Roti Pisang too. Pasar Air Itam, famous for its good food and very near Kek Lok Si, but Laksa in Joo Hooi might be better. Paya Terubong Seafood, the place is crowded and they ran out of crab and sotong when we arrive at 9pm. The seafood is not bad. Other Recommendations: Anba Coconut, Batu Lancang Foodcourt, Curry Mee Sisters, Edelweiss Swiss Cafe, Kheng Pin Cafe, Teluk Kumbar Seafood and Transfer Road Roti Canai. 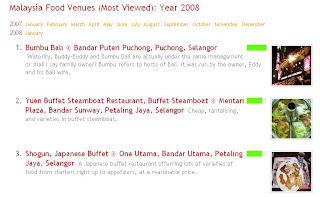 The November 2008 Most Visited Food Venue (based on Google Analytics pageview), brought to you by Malaysia Most Wanted Food and Restaurants. The top 3 spot for this month is still dominated by Japanese Food and Buffet, but Jogoya had managed to regained the number 1 spot (hopefully it is for the better and not just hype). For the top 10, we have Look Out Point aka KL Night View, Hajime the High Class Japanese Food, Neway Karaoke in Cheras (for some odd reason), Yuen Buffet the Affordable yet Delicious Steamboat, Sky Bar the Classy Bar, the Shabby William Mamak and Lemon Garden Café the Shangri-La Buffet. We have the usual old timer like Bavarian Bierhaus (German), Bumbu Bali (Balinese), Shabu Shabu (Japanese), Marco Polo (Chinese), Tupai-Tupai (Malay) and SS2 Murni (Mamak). A good variety of cuisine huh! Other notable mention is The Cave @ SS2 - kind of like a concept restaurant for couples, Rakuzen at Chulan Square and Boat House at TTDI. Ninja Jones at Mid Valley is back to the list, with the ever fast and affordable New Paris Restaurant @ SS2. Check out the Top 50 most popular restaurants for the month of November 2008 yourself. Malaysia Most Wanted MAP is ALIVE! After months of preparation and testing, Malaysia Most Wanted (MMW) is proud to launch Map of Malaysia, to help you reach the destination and understand the surrounding neighborhood. We have an online map (using Google Map Technology) which shows proper street maps and satellite images of the area. We added in Placemark (small little meaningful icons to indicate the nature of the place) which label the surrounding buildings and area, such as Banks, Parks, Offices, Shopping Malls and etc to help you easily identify and understand the area. You could search for any address or name of places / buildings / business to find your desired map with its surrounding places clearly marked. 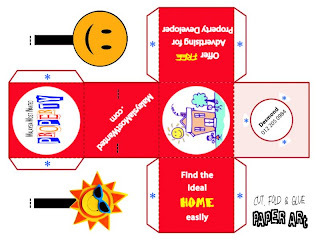 To help you find your away around unfamiliar places by showing the correct map with proper landmarks. Especially when I want to find a particular shop or attend an interview in unfamiliar address, or finding good food around Ipoh or places to travel in Penang. To help you understand the neighborhood and surrounding area better, such as what are the public amenities around, or are there any hidden lake or places that I never noticed before. I might be considering of moving to Bandar Baru Klang, and I am interested to know how developed is the place and what shops are available within walking distance. Why is certain map empty without any Placemark? We are currently working on marking as much of Malaysia as possible, so quite a number of places are not fully covered yet. You could do you part by helping us to mark area you are familiar with, by clicking on “Add Placemark” at the left hand corner of the Map. We hope Malaysia Most Wanted Map will make Malaysia more accessible and make finding places as easy as 123. Ever wonder what to do during the weekend, and always thought that there is nothing to do in Malaysia. Think again, as we open up for options to ease your dry weekend. We have the 19th Raja Muda Selangor International Regatta starting this weekend (hopefully it’s still on) at Port Klang, BAKUC – Bandai Action Kits Universal Cup 2008 at Sungei Wang, ASIMO Roadshows at One Utama. For Art and Music, check out Francissca Peter @ NBT, Bangsawan Batu Belah Batu Bertangkup at DBKL City Theatre and Rhythm of the Soul at Dewan Sivik. For those into performance and music, we have T4YP Sweatshop at KLPac, Hacken’s Concert Hall Live In Malaysia at Genting, KL Hip Hop Festival at Sri Hartmas, U.O.X Play: Block Party at Capital Square or Fly FM 3rd Fly-aniversary at One Utama. Penang Bridge International Marathon is on this Sunday, too late to register but still okay to join the crowd. We have CREST (Crisis Relief Services & Training Berhad) charity dinner at Sunway Resort Hotel, and the happening and very fun (yet affordable) Music Against Racism at Menara KL. 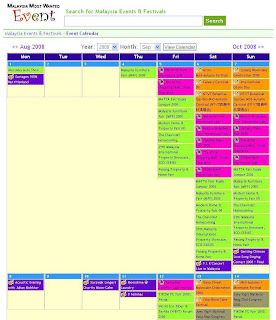 For a complete list of event, checkout our Monthly Calendar or Weekly Event Listing. Thanks to your support and frequent visit, Malaysia Most Wanted (MMW) had upgraded to a bigger and better home to serve you better (hopefully more uptime and faster speed). Some might experience problem in accessing the website due DNS Propogation, but it should be solved by now since we had moved for more than 48 hours. If you had any difficulty accessing the website (or found the website misbehaving), leave a comment here and we will certainly look into it. 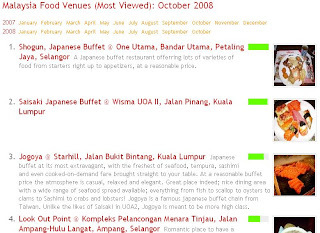 The October 2008 Most Visited Food Venue (based on Google Analytics pageview), brought to you by Malaysia Most Wanted Food and Restaurants. 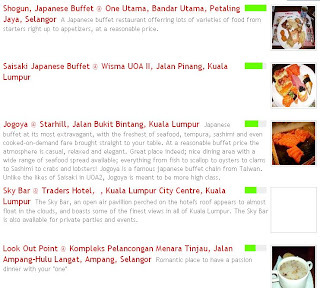 This month, the top 3 spot went to Buffet (Malaysian sure is Tham Jiak), and Japanese food influenced buffet. I realise Shogun and Saisaki are probably sister company, and it is good value for money at the moment. The “Night View of KL” spot: Look Out Point is still pretty popular, followed by the ever affordable Yuen Buffet Steamboat with its hot chicken wing. It’s a surprise that Hajime is at the 6th spot now, either it is really good or people are more loaded during the bad economy time, or both. The Best Satay of Malaysia from the Satay Town: Restoran Sate Kajang Hj. Samuri is still holding strong, followed by the shabby Williams Mamak and classy Sky Bar. Others notable mentions include the all time favourite Shabu Shabu and Bumbu Bali in Puchong, Delicious Café in Bangsar, The Cave and Murni in SS2, Chef & Brew in Bukit Damansara, Boat House in TTDI and Ninja Jones in Mid Valley. Some not so new comers (for those who got tired of the good old food and want something fresh), you could check out Cupcake Chic (The Curve), Opus (Bangsar), Tasty Pot Restaurant (Taman Mewah Jaya, PJ), Agefuku Japanese Restaurant (USJ Taipan), Shilla Korean Buffer (The Curve), Big Plate (Subang Permai) and Nihon Kai Japanese Restaurant (Old Klang Road). We have the all fun Eco Film Fest 2008 @ Akademi Seni Budaya dan Warisan Kebangsaan (ASWARA), Jalan Tun Ismail, Kuala Lumpur, don't miss the great party. At the same time, do visit the Bijou Bazaar for some good shopping. You could catch hold of Allan & Indi Hold Court in Putrajaya for some comedy, or party at Heineken Green Room. For children, don't miss the Toys"R" Us Halloween Costume Competition; For Film Buff, do catch the MASKARA Shorties. For outdoor enthusiast, check out UFL Year End Sale in conjunction with ASTEX 2008, Adventure Sports & Travel Expo. For some great music and performance, don't miss the Dama Vocal Festival 2008, Acoustic Jaya All Female Weekend and Backyard JAMFest 2008. For November, we have the Malaysia International Gourmet Festival @ Malaysia kickstaring, so be prepared for many affordable yet great food to pamper our precious stomach. The kick-off of Darwin-Bali PD-Langkawi Yacht Rally 2008 @ Admiral Marina & Leisure Club, Port Dickson, Negeri Sembilan might be interesting, and not to forget Langkawi International Fishing Tournament (LIFT) @ Tukun Perak Island, Langkawi, Kedah. 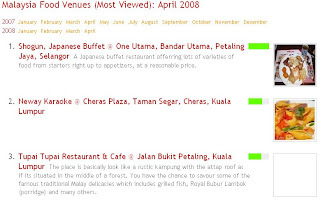 The September 2008 Most Visited Food Venue (based on Google Analytics pageview), brought to you by Malaysia Most Wanted Food and Restaurants. I travelled into the mountains and out of Internet + TV for 3 weeks, and I really crave for some good old Malaysian food after that. Now I think no other country can beat the diversity and deliciousness of Malaysian food (of course, I am a Malaysian). Not much changes to the Top 3 spots (and it ain’t easy to knock down the most popular place in town). Jogoya is still at the 4th place despite the negative reviews, so it proves that popular doesn’t mean good. We all like a good KL city night view together with out dinner, and Look Out Point could give you just that. Cheap and nice steamboat is available at Yuen Buffet Steamboat. 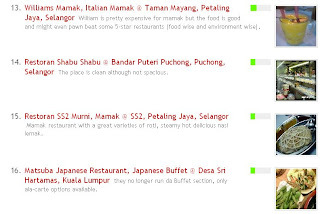 Big Plate Restaurant and Williams Mamak is doing very well this month in the Top 10 list. Some new comers includes Hartz Chicken Buffet, Chitralada Palace, Carnaval Churrascaria, The Cave, Little Penang Café, Al Diafah, Shilla Korean Buffet and Xenri. Sometimes I just wonder where is the best Wantan Mee in town, and I will find out the answer for that soon. 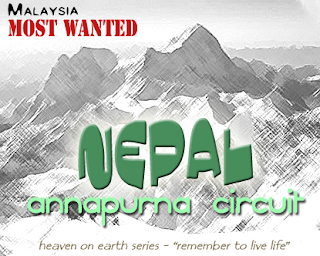 Nepal Annapurna Circuit - "Remember to live life"
You can now view all the Happenings in Malaysia using a singular Monthly Event Calendar, different categories (Art, Festival, Sales, etc) are marked with different color (with icons too). Just put your mouse cursor over the event’s title for more detail, or click on the link for the full detail. Check out This Month's Most Happening Event! The 2nd week of September 2008 is pretty quiet, filled with Arts and Mooncake / Mid-Autumn Festival Celebration (14 Sep 2008). We have several mooncake festivals celebration, and hopefully more events will surfaced by the end of the week. Music for the weekend includes Adil Johan Quartet with Melisa Suciati, Rachel Guerzo Quartet, Asiabeat Project and Moonshine @ Laundry. Art Exhibitions: Embracing the Arts, Samsudin Wahab, The Boy Who Loved Clouds, Wallscapes: Jiawei Shen and Merdeka, Sweet Flavour - Mohd Fauzi Sedon, Pelukis & Peristiwa, First Impressions - J-Cent Mu and The Indonesian Modern Arts by Artist Wayan Gede Susana. Check our more events for This Week (8-14 Sep 2008). We have Astro Mid-Autumn Festival at Auto-City, Penang, and it seems that F.I.R Concerts had been postponed until November. Genting Arena of Stars is hosting Genting Chinese Love Song Singing Contest 2008 Final, and Calvary Church is hosting Carnival 08 at Bukit Jalil Golf and Country Resort. Check out more of this weekend’s event, with some warehouse sales as usual. 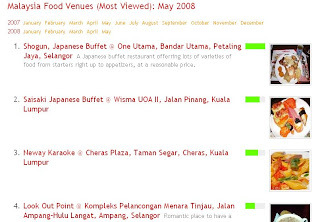 The August 2008 Most Visited Food Venue (based on Google Analytics pageview), brought to you by Malaysia Most Wanted Food and Restaurants. I wonder why did Jogoya manage to make a comeback, did the food gotten better and the pricing is more reasonable now? The classy Sky Bar is standing strong at 4th place, followed by good scenery from Look Out Point. Yuen Buffer is another food bargainers heaven, and of course the mysterious Tupai-Tupai. New comer Williams Mamak is the Malaysian midnight favourite (as compared to SS2 Murni), and Bumbu Bali never loses its charm since the beginning. Enough of the old boys, lets see if there is anything new. New faces includes Chef & Brew, Sri Ayutthaya, Nihon Kai and Momo. Returning new comers include Hajime, Matsuba, Noble House Imbi, Boat House, Delicious Café, Bavarian Bierhaus, Lala Chong and Marco Polo. We have Blue Dragon and My Elephant coming back to Top 50, pretty affordable and nice place to dine. 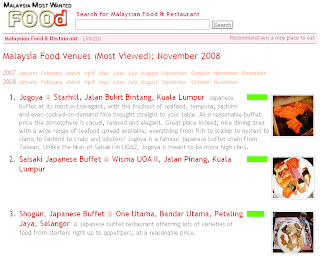 Thank you everyone for making MMW Food the No 1 website to find yummy food in Malaysia :) Every recommendation counts. Jiak Jiak Jiak! Be sure to check out Malaysia International Fireworks Competition 2008 @ Putrajaya International Convention Centre (PICC), Precicnt 5, Putrajaya. The Star Newspaper reported that Merdeka Eve celebration would take place at Dataran Merdeka, KLCC and Bukit Bintang. I am sure all the clubs and pubs would put an extra effort to beef up the celebrations and increase the city's intoxication level over the long weekend. Check out for more Merdeka Eve Events. Ever feel bored over the weekend and can’t figure what to do besides yum cha and watching movie? You are in luck, as Malaysia Most Wanted Event let you know of the happening events around Malaysia all year round, and save you from "boredom". Arts, Culture & Entertainment, perhaps a bit of orchestra, music or live performances to spice up your life a bit, and stretch our artistic cell slightly. Conventions & Exhibitions, we all love freebies, booth babes, gadgets and spend a few hours looking to best bargains in town. Festivals & Celebrations, its party time! Join the fun and prepare your DSLR camera! Sales & Promotions, time to save money and spend more at the same time, ironic! Sports, perhaps a little bit of marathon, triathlon, hiking, cycling, etc. We have about 150++ events covered so far, and would continue to do much better. 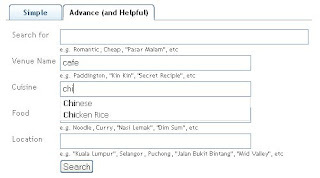 You could expect standard Malaysia Most Wanted Application such as those in MMW Food, including powerful search, easy browsing, user contributions and etc. 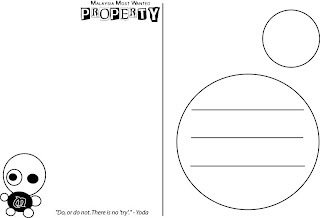 Malaysia Most Wanted Property & Real Estates supports Advance Search using various criteria such as project name, price, property type, land tenure, developer and location. How to search by Price? 200K (or 200000), to search for property in the around the price of RM 200,000 (somewhere between RM 150-250K). 100-200K (or 100 to 200 K), the price range of RM 100,000 – 200,000. >200K (or more than 200K), to search for any properties priced from RM 200,000 and above. <200k (or less than 200K), for any properties priced below RM 200,000. The Price criteria could be used as part of the simple search syntax, just type in “price: 200K”. 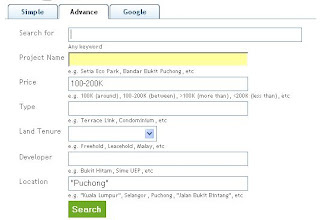 You could add in additional keywords as well, such as “Puchong price:200K”. Like others Malaysia Most Wanted application, we provide 3 ways to search for Malaysia Most Wanted Property & Real Estates. Google – a powerful search engine powered by Google. Just type in any keywords to search for. Type, property type such as terrace link, condominium, bungalow, semi detached, shop, etc. Land Tenure, such as Freehold, Leasehold or Malay Reserve Land. Developer, name of the property developer such as Bukit Hitam, Sime UEP and etc. Beware that sometimes big developers like SP Setia or IOI used their sub companies as developers. 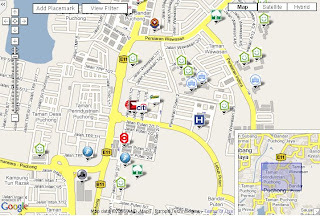 Location, type in any locations may it be state, area, street or taman. As usual, we have automatic recommended word list support. 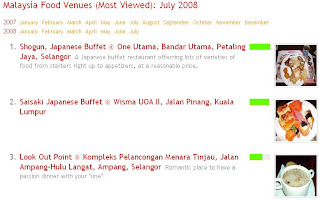 The July 2008 Most Visited Food Venue (based on Google Analytics pageview), brought to you by Malaysia Most Wanted Food and Restaurants. Look Out Point still stays at a romantic and affordable place to have dinner with a nice KL City night view free of charge. Besides Look Out Point, people could opt for Gasoline or Bread and Olive at the same spot as well (recommended by fat_blob). Jogoya still stays at 4th place, with the cool and beautiful Sky Bar at 6th, and the cheap and nice Yuen Buffet steamboat stay strong at 7th place. We have Tupai-Tupai for the traditional Malay food, Carl’s Jr for the big and expensive burgers and Malaysian favorite Mamak-styled Williams Mamak. Others worth mentioning are Lemon Garden Café for Hi Tea Buffer, Hajime for a classy Japanese meal, Delicious Café for another expensive treat on western cuisine in Bangsar, and the affordable and homely Bon Bon’s café. Some notable new comers include Noble House Imbi for some expensive Chinese dining, Matsuba or Rakuzen or Okuchi for a good Japanese meal, or Boat House the hidden Gem of TTDI for a good western meal, or check out Chef & Brew or Cameo Restaurant & Wine Bar for a expensive dinner treat. Yet another fruitful and delicious month, yummy! 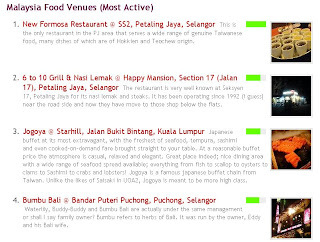 The June 2008 Most Visited Food Venue (based on Google Analytics pageview) result for Malaysia Most Wanted Food. Look Out Point is still a nice place to have a magnificent view of KL’s night view, not too sure about the food. Carl’s Junior is one of the latest burger franchise craze in town, charbroil burger with a big size and big prize tag. Williams Mamak, Italian Mamak @ Taman Mayang, Petaling Jaya, Selangor is quite a new entry, serving Italian food at mamak. Restoran Shabu Shabu @ Bandar Puteri Puchong, Puchong, Selangor is gaining popularity fast around Bandar Puteri area by serving affordable and nice Japanese steamboat. It's already July, with half of 2008 behind us. Maybe it's time for a half-yearly review of favaourite food and restaurants of fellow Malaysian. Easy searching had always been the core principal behind all Malaysia Most Wanted design, and the same goes for Malaysia Most Wanted Property. You don’t have to fill in all the criteria or fields; you could start by 1 criteria and narrow the search result down by more criteria later. Words Recommendation is available to help you select your criteria more effectively. The recommended list will get shorter all you type in more characters. Notice the double quote around each select word(s) from the list, which is more exact matching. For example, Bandar Bukit Puchong without the double quote will find result which match either Bandar OR Bukit OR Puchong (Bandar could return many irrelevant result, such as Bandar Bukit Tinggi). Putting a double quote around “Bandar Bukit Puchong” ensure exact match and better results in this case. 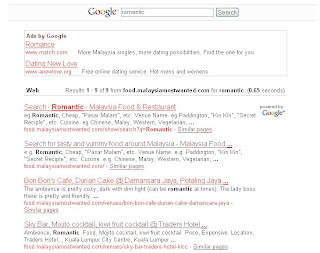 Malaysia Most Wanted Property added an alternative Google Search for more effective searching. You could refer to Google Cheat Sheet for a full list of their syntax and operators for different kind of searches. Look for this the RSS icon (it should be around the toolbar area if you are using IE7 or Firefox) and click on it, so that you can received daily feed of the latest posting. You can also find it at each Venue page right under the Advertisement. 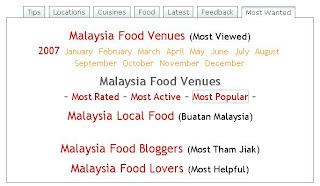 The May Food 2008 Most Viewed Food Venue (based on Google Analytics pageview) result for Malaysia Most Wanted FOOD. Shogun, Japanese Buffet @ One Utama, Bandar Utama, Petaling Jaya, Selangor is still holding strong on the no 1 spot. I guess it does have an advantage for being in a popular shopping complex become the talk of the town. Maybe I should give it a try someday and add to the statistic. Saisaki Japanese Buffet @ Wisma UOA II, Jalan Pinang, Kuala Lumpur had gained the no 2 spot, another Japanese buffer which had been around for quite a while. Malaysia must have been crazy about buffet these days. Neway Karaoke @ Cheras Plaza, Taman Segar, Cheras, Kuala Lumpur is still at the top 3, and I wonder why. Izzit because of Cheras folks, or izzit about karaoke, it can’t be about the food right? As usually, we have the same old popular venues like Look Out Point, Jogoya, Sky Bar, Yuen Buffet, Tupai Tupai, Bumbu Bali, SS2 Murni, New Paris and etc. Some of the noticeable newcomer include Carl’s Jr, which serve very expensive charbroil burger. Matsuba Japanese Restaurant in Desa Sri Hartamas is coming up, and Pantai Seafood Restaurant at Kaya Ara is no stranger as well. Rakuzen Japanese Restaurant at Chulan Square seems to be gaining popularity fast, and perhaps it’s worth to check out Big Plate Restaurant at Subang Permai. Though there are not much changes in the top 10 spot, but the top 50 does introduces many new places worth checking out. Maybe it’s time to switch it to be top 100 instead, the more choices the better? 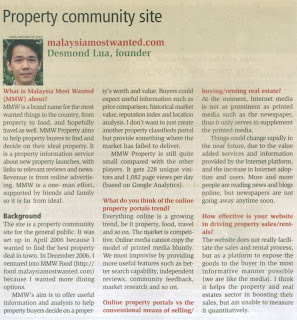 Malaysia Most Wanted Property v2.0 is finally A-LIVE!!! She had been upgraded to the more community friendly platform as MMW Food, after months of work (and delay, haha). This could open up the opportunity for more exciting features to come. All MalaysiaMostWanted Services (Property, Food, etc) shared the same Login/Username. Create your User Account once and login anywhere. Our focus for weeks to come is to update the database with more property projects and latest information, followed by implementation of advance search feature and continuous upgrade to provide more user friendly features. 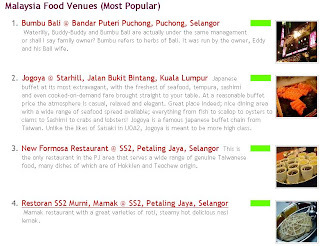 The April Food 2008 Most Viewed Food Venue (based on Google Analytics pageview) result for Malaysia Most Wanted FOOD. Shogun, Japanese Buffet @ One Utama, Bandar Utama, Petaling Jaya, Selangor had been hot for the past 3 months, seems like the latest buffet craze in town after Jogoya (at fifth Place). I saw a disallowed photography sign at the Sunway Pyramid branch, so might be a slight inconvenience for food bloggers. Neway Karaoke @ Cheras Plaza, Taman Segar, Cheras, Kuala Lumpur is back at second place, and I am not sure the food or the karaoke is more popular there. The 3rd place is Tupai Tupai Restaurant & Cafe @ Jalan Bukit Petaling, Kuala Lumpur making a comeback. This place must had serve pretty good Malay food, or people are curious about this restaurant every time passing by. 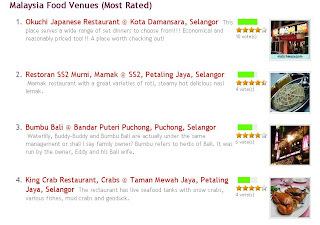 Recent darling Sky Bar still holding at 4th place, and the ever cheap and nice Yuen Buffet Steamboat is at 6th place. We have Saisaki at 8th place, and the romanctic Look Out Point at 11th place. Other notable mention include Bon Bon’s Café, New Paris Restaurant, SS2 Murni, Boat House Restaurant and Dae Sa Kwan Korean BBQ Restaurant. Malaysia Most Wanted had finally got its first limelight at TheEdge Malaysia. I am glad that it did get some attention and people are finding it worthwhile, but there is still a lot of work to be done. I need to update site with the latest property offering, and not to mentioned the vital property analysis which is promised to be the core of the entire site. Since I am labeled as “property community site”, I think it’s due time to migrate the more community friendly platform of MMW Food to MMW Property to really encourage and allow some community participation. 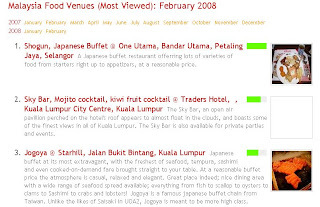 The Malaysia Food February 2008 Review (based on Google Analytics pageview) result for Malaysia Most Wanted FOOD. March is the month where we see quite a few of the old favourite coming back to the top 10 list. Shogun, Japanese Buffet @ One Utama, Bandar Utama, Petaling Jaya, Selangor still top the list this month, I guess Malaysia have a thing with Buffet and Japanese food in a shopping complex. It got a rating of 3.5 out of 5 from 6 votes. Sky Bar @ Traders Hotel, Kuala Lumpur City Centre, Kuala Lumpur is still a happening place for this city, where people pay to feel good. Lemon Garden Cafe, Hi Tea Buffet @ Shangri-La Hotel, Jalan Sultan Ismail, Kuala Lumpur is gaining popularity fast with its delicious looking food. Yuen Buffet Steamboat Restaurant, Buffet Steamboat @ Mentari Plaza, Bandar Sunway, Petaling Jaya, Selangor is still holding strong at 4th place with its cheap and nice buffet steamboat, with Tupai Tupai Restaurant & Cafe @ Jalan Bukit Petaling, Kuala Lumpur making a comeback at 5th place. The strange thing is we have Neway Karaoke @ Cheras Plaza, Taman Segar, Cheras, Kuala Lumpur at 7th place, probably Cheras people must have like to express their singing talent dearly. The ever delicious Restoran SS2 Murni, Mamak @ SS2, Petaling Jaya, Selangor is at 8th place, and Bumbu Bali @ Bandar Puteri Puchong, Puchong, Selangor is still holding at 10th place. It’s another fruitful month, dominated mostly by old but still yummy players. Yuen Buffet had dropped to the No 4th spot while Ninja Jones is gaining popularity at the No 5th spot. Last month’s winner Bumbu Bali is at No 7th with Look Out Point (Gasoline Café) climbing to the No. 10th spot. Different people like to do things differently, thus we should provide different way for each to perform the same task. 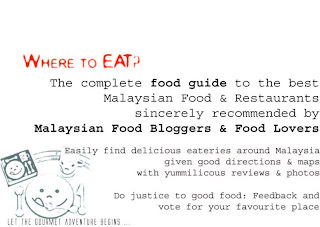 So, we give you 3 ways to search for Malaysia Food. Just type anything you are interested with, and click search. You can use double quote(") for exact word match, or use special tag to search by cuisine, location, food or name (name of the place). More help on Simple Search. A slightly advance way, put more powerful to narrow down your search. You could choose to search by any keyword as usual, and to narrow down your search result by venue name, cuisine, food or location. More help on Advance Search. It is the time of the year, where everyone would crowd together to have a romantic dinner with their loves one on the same night. It’s seems like a fate that no couples could escape, due to society pressures and irrelevant origins. No matter what, we still need to find a good spot to dine. Someplace cozy, perhaps romantic, decent food and definitely not cheap (at least not too cheap). The spots which comes to my mine is always Bangsar, Hartamas and Pavilion perhaps? Let see what I could dig out from Malaysia Most Wanted Food and Malaysia Foodies. Sky Bar or Luna Bar seems like a good place, classy and nice view, definitely expensive, uncertain about the food. I tried La Bodega before, nice environment with nice food. Look Out Point seems like a good option, with a nice night view. Maybe some Chocolate Fondue at Fondue House. Perhaps some more classy place, such as Cameo, Vincenzo Ristorante Italiano, Opus, Rick's Cafe Casablanca or Saffron. For good food, probably Bumbu Bali, or King Crab if you are really a crab lover (not romantic though), Ninja Jones, Max! Kitchen and Wines, My Elephant, Italiannies, Food Foundry, Isthmus KL, El Cerdo, Sandias, Daorae Garden. 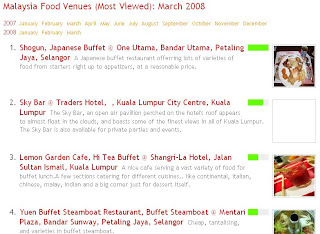 The January Food 2008 Most Viewed Food Venue (based on Google Analytics pageview) result for Malaysia Most Wanted FOOD. Bumbu Bali @ Bandar Puteri Puchong, Puchong, Selangor seems to be the most popular restaurants around, continuing its winning spree since 2007 offering delicious balienese food. The runner up is Yuen Buffet Steamboat Restaurant, Buffet Steamboat @ Mentari Plaza, Bandar Sunway, Petaling Jaya, Selangor, offering cheap, tantalising and varieties in buffer steamboat. The third place goes to Shogun, Japanese Buffet @ One Utama, Bandar Utama, Petaling Jaya, Selangor: A Japanese buffet restaurant offering lots of varieties of food from starters right up to appetizers, at a reasonable price. 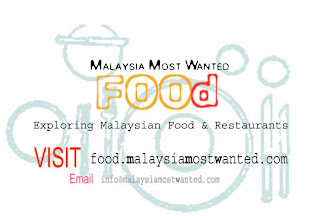 In conjunction with our vision to gather the most wanted information about Malaysia, it’s time for us to integrate Food and Property at Malaysia Most Wanted Main Page. First time user can choose to search for Food (Restaurant) or Property (Real Estate) related result from the Main Page, where it shall be redirected to the relevant service page. A similar top banner is available at every service page to allow navigation between different services provided by Malaysia Most Wanted. We shall upgrade Property (by end of February) to the similar platform as Food to encourage community participation, where user could put in comment, write reviews, rate their favourite properties, find their property using Google Maps and etc. We can do all the things to find good food in Malaysia, only if we know how. We have been working very hard to come up with various ways to find good food in a easy and accurate manner, and we we want to do it better. We need you (Yes, you) to tell us what more we could do to please you. We need recommendation and criticism :) Please feel free to start posting your feedback by leaving a comment, or email to info [at] malaysiamostwanted (dot) com. We need to know what we had done right, or done wrong. The quest to find the best food in Malaysia continues. 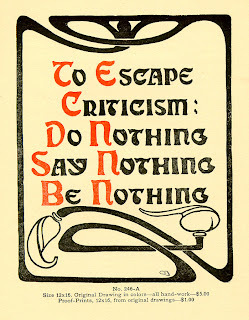 If you don’t like the result, you have the power to do something about it.